Weekdays at our country inn provide a perfect setting and a competitive rate for business travelers. Complimentary Wi-Fi throughout the house. Ample quiet common areas to work independently or to meet with colleagues. Hearty and healthy breakfasts served as early as 7:00 a.m., accommodating your business schedule (breakfast is included in nightly rate). The option of inviting additional guests to breakfast for a focused and efficient start to the day (at $15 per person, all gratuities and taxes included). Easy access to a full-sized ironing board and iron. Complimentary goodies such as mulled Vermont apple cider and homemade soup on winter afternoons, our bottomless cookie jar filled with fresh homemade cookies, and constant access to freshly brewed coffees and teas. Just give us a call (802) 226-7744 or send us an email and let us take care of your traveling needs. Considering a small business retreat? Sometimes you need to get away from the fluorescent lights and heavy desks of the corporate world to put your team’s creative power into action. At our Vermont Bed and Breakfast, we’ll energize your group with efficiency and professionalism while softening the tone with fantastic food and comfortable, relaxed surroundings. You may even choose to extend your event so you can also find time to build relationships while hiking, skiing or enjoying our summertime pool and grounds after powering through your agenda. 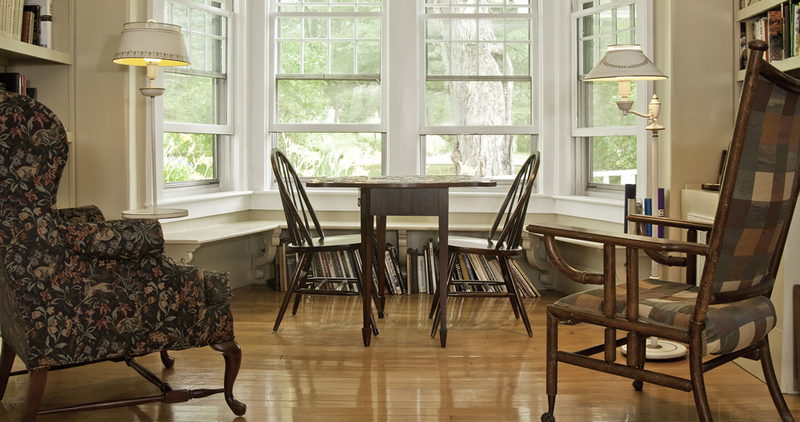 When you rent the whole house, your group benefits from quiet privacy with flexible informal space for full-group meetings and smaller break-out sessions. We have Wi-Fi throughout the building and we can help with arrangements for any presentation items you may need. The dining room and tables are perfect for presentation space, or we can set up conference tables in our extra-long living room. Based on availability, your organization may rent the entire house for a single day and night or, to offer your participants time for engaging business tasks plus some time to decompress and socialize, you may opt for an extended retreat. A healthy, hearty breakfast is a part of every overnight stay at Golden Stage Inn. We are happy to cater other meals if you prefer not to leave the site, or we can point you to lunch spots within walking distance, and several dinner restaurants just five minutes away. For additional information, see our Rent the Whole House page.